With today’s release of a dynamic scoring estimate of the Senate’s version of the Tax Cuts and Jobs Act, the Joint Committee on Taxation (JCT) confirms that tax changes impact economic growth. While JCT’s estimates are positive, there is reason to believe that the tax plan would produce even greater dynamic effects than its analysis shows. JCT estimates that the federal government would see an increase in revenue of $458 billion over the next decade from the economic growth, while growing the nation’s GDP on average by 0.8 percent. While the static cost of the bill is still estimated to be almost $1.414 trillion, the overall costs are now lower at approximately $1 trillion. This range of estimates highlights the importance of JCT providing Congress with dynamic estimates, and reflects years of JCT’s hard work to develop this model. However, JCT’s results should be viewed as likely underestimating the economic growth spurred by this tax bill. The range of estimates from JCT includes several important assumptions that limit its growth results, particularly, assumptions regarding the Federal Reserve’s response to potential inflation and the United States being a closed economy. As we’ve long argued, the United States is not a closed economy, but rather functions as a small, open economy. While the United States represented approximately 40 percent of the world’s economy in the 1960s, that is now less than 25 percent, with large international capital inflows annually. This matters, because assuming the United States is a closed economy assumes that capital is not available to help finance the rapid increase in economic growth. Without an open economy, U.S. businesses are limited to U.S. savings for investment, which is being eroded by increased government borrowing. This crowds out the opportunity for small business to invest because the limited savings bids up the cost of borrowing. However, when savings from foreign investors is available, U.S. businesses have access to a plethora of savings. As long as there are economically viable projects, foreign investors funnel savings into the United States to take advantage of the opportunity. Moreover, U.S. investors with assets in foreign countries can choose to sell their investment abroad and purchase U.S. assets. This is another channel by which an open economy draws in investment from the rest of the world. Second, JCT assumes that the Federal Reserve accommodates the increased demand for investment by keeping rates low or attempts to fight inflation by raising interest rates through its open market activities. The JCT’s score includes Federal Reserve activity that would counteract the economic expansion from tax cuts. JCT’s assumption on an aggressive Federal Reserve also doesn’t seem quite reflective of the current U.S. economy. Historically, the Federal Reserve has been conscious about rapidly changing the interest rate. Rapid changes often create unintended consequences. Given the interest rate is functionally near zero, it is unlikely that the Federal Reserve will increase the rate above and beyond its current schedule, which has already been priced into the economy. The Senate’s version of the Tax Cuts and Jobs Act (TCJA) includes several important changes to the taxation of multinational corporations. The international provisions of the Senate’s bill are similar to those in the House’s bill, but there are key differences in their base erosion rules. The main purpose of the international provisions in the Senate bill is to introduce a territorial system to the taxation of multinational corporate income. This includes the introduction of a participation exemption, the strengthening of base erosion rules, and transition rules for deferred income. However, the Senate bill also includes provisions to encourage multinational businesses to move intellectual property to the United States. The Senate bill has a 100 percent dividend deduction as the participation exemption. This includes a rule to limit losses for sale or transfer when dividends are paid to the parent corporation. To facilitate the move from a worldwide to a territorial system, the bill includes a deemed repatriation provision. Deferred earnings are subject to a 10 percent tax if cash or cash equivalent or 5 percent tax for reinvested earnings. S corporations are exempt from deemed repatriation. REITs can exclude the deferred earnings from their gross income test. Corporations have eight years to pay the tax on deferred earnings. A minimum payment of 8 percent is required for the first five years, 15 percent for the sixth year, 20 percent for the seventh year, and 25 percent for the eighth year. Unlike the House version of the TCJA, the Senate bill includes a 37.5 percent deduction on foreign-derived income above a threshold. Businesses with income from foreign sales receive a deduction for all income above a normal return on assets related to that income. The Senate bill defines normal income as 10 percent of all tangible, depreciable assets, which excludes intangibles like patents. As such, this provision lowers the effective rate on foreign income derived from intangible assets to 12.5 percent. The provision is not technically an innovations box, but it has the same result. Typically, innovation boxes distinguish which income receives a lower rate based on research and development expenditures, royalty payments, or intangible assets. Although this provision does not use any of these tests, it does reduce the effective tax rate on income from intellectual property. It seems that this provision is intended to encourage multinationals to locate intangibles in the United States. The assumption is bolstered by the inclusion of special rules for transferring intangible assets from controlled foreign corporations to a U.S. shareholder. This provision allows a U.S. parent to transfer an intangible asset without triggering a taxable event, such as capital gains from the sale of the asset. The current year inclusion of global intangible low-taxed income by United States shareholders does not distinguish between high-tax or low-tax countries. Instead, the rule requires a U.S. parent company to include 50 percent of all foreign subsidiaries’ income above a normal return into the parent’s taxable base. This provision excludes from income any effectively connected income, subpart F income, foreign oil or gas income, or certain related party payments. The provision defines normal returns as 10 percent of all the tangible, depreciable assets held by all foreign subsidiaries within the parent’s network. In this case, U.S. parents with intangible assets, such as patents and copyrights, in any foreign country would be required to include half of the income into the parent’s taxable base. To avoid double taxation, the U.S. parent can use 80 percent of the foreign tax credits related to the included income against their tax liability. The remaining 20 percent cannot be carryforward or backward. Most U.S. parents with intangibles in higher-tax countries should have enough foreign tax credits as to avoid the tax while U.S. parents with intangible assets in low-tax countries would have an additional liability because there are no foreign tax credits available. As such, this provision acts like an additional tax on intangible income from low-tax countries without explicitly identifying low-tax countries. The Senate bill also includes a limit on the interest deduction for corporations within a global network. This provision does not replace the domestic limitation of interest deduction, but it is an additional limitation stacked on top of the domestic provision. In this provision, the interest deduction for a corporation within a “worldwide affiliate group” is limited to the a portion of the total interest paid by the group, where the portion is based on the share of group’s total income earned by the U.S. corporation. For example, a U.S. subsidiary of a foreign parent has $10 million of income within a group with a total income of $100 million. The subsidiary has $5 million in interest payments, but the group only has a total of $20 million in interest payments. In this case, the subsidiary would only be allowed to deduct $2 million in interest payments, (10/100)*20. The inbound rule in the Senate bill acts like an alternative minimum tax for corporations that conduct business with foreign-related corporations. In the provision, corporations with effectively connected income are required to calculate their tax with two methods. First, the corporation calculates its taxes using the standard domestic method, which includes deducting payment to the foreign-related corporations. Second, the corporation calculates its taxes without deducting payments from the foreign-related corporation but applying a 10 percent rate to the base rather than the statutory 20 percent. If the second calculation is greater than the first, the corporations pays the difference between the two calculations in additional taxes. This provision applies to all payments between a U.S. corporation and a foreign-related corporation except for goods sold. Earlier today, The New York Times put out a great visualization of what the tax bill would look like for middle-class families. With the help of the Open Source Policy Center, they illustrated new tax liabilities for 25,000 sample families. Some of our earlier blog posts revolved around illustrating the proposal’s effects on a smaller set of nine families. A smaller set of data helps visualize the changes on an individual level, but it doesn’t fully capture the inherent complexity among millions of American taxpayers. However, it is worth noting that The Times only conducted a static analysis; dynamic results that account for economic growth show a more complete picture of how tax reform could benefit different taxpayers. The visualization highlights that many families, similar to our analysis, would see a tax decrease in 2018 under the Senate’s tax plan. When considering households that currently take the standard deduction, nearly everyone gets a tax cut, but the results are split more evenly when factoring in individuals who itemize. From the selected sample families, about 40 percent of households that itemize would see a tax increase in 2018 under the proposed Senate bill. Many factors lead to these results. Recent tax reform proposals have emphasized removing tax preferences by cutting tax expenditures as a means to pay for lower overall rates, but this inherently means that some who currently benefit from such tax preferences could see a tax increase. Eliminating the deduction for state and local taxes could increase tax burdens on taxpayers from states with high state and local tax rates, such as New York, California, and Connecticut. Additionally, tax cuts for households without children are much less pronounced as they do not benefit from the enhanced child tax credit in the Senate bill. The proposed Senate bill would double the child tax credit to $2,000 per child and would not begin phasing out that benefit until households earn $500,000. This enhancement results in larger tax cuts for families with children and thus offsets some of the effects of removing other specific tax preferences for these families. However, households without children do not receive any benefit from this provision—about half these families would see tax increases without the benefit of the expanded child tax credit. Overall, as analysis from the Joint Committee on Taxation (JCT) shows, all income groups do see a decrease in tax liability in 2018. Due to the temporary nature of the individual portion of the Senate proposal, in 2027, the spread of families with tax increases compared to tax decreases looks much less certain. If the individual provisions sunset after 2025, as currently stated in the bill, almost all Americans would see a tax increase on a static basis when compared to current law. This would occur mainly because the Senate proposal includes changing the measure by which tax brackets are adjusted for inflation. Moving from the traditional Consumer Price Index (CPI), the Senate proposal adopts the Chained Consumer Price Index (C-CPI) measure of inflation. C-CPI is typically a less generous inflator, but the move will more accurately account for product substitutions in reaction to price fluctuations. However, these results only include static tax calculations, and do not attempt to account for any economic growth generated from the Senate’s tax plan. Incorporating the JCT’s assumption that 25 percent of the economic benefit of corporate income tax cuts are passed on to workers in the form of higher incomes results in far fewer families facing a tax increase. In fact, almost half the sample families would see a tax cut in 2027 under the changes in the Senate bill, even assuming other individual provisions would be sunset. Additionally, this likely understates the dynamic impacts of the corporate tax changes, as JCT’s 25 percent assumption is conservative. Increasing the dynamic response of the corporate tax changes would increase the likelihood that individuals would receive a tax cut in the out years. Despite this, there are questions as to whether Congress would allow these tax cuts to expire. Previous tax cuts under previous administrations were extended, limiting the potential future tax increase, though raising the overall cost of the plan. While these estimates provide a great visualization of what the Senate bill changes would look like for middle-class families, they only do so on a static basis. Incorporating the full dynamic feedback that would occur because of the proposed tax changes would provide a more accurate picture of new tax liabilities for middle-class families. The Senate draft of the Tax Cuts and Jobs Act would require sellers of stock in any one company to dispose of shares in the order they were acquired. Sellers could no longer designate which blocks of their shares they wished to sell to minimize capital gains taxes. The new rule would be “first in, first out” (FIFO). Under current law, shareholders who purchased stock at different times at different prices may select which blocks of stock to sell. To minimize current capital gains, the shareholder might select the stock bought at the highest price. To “harvest” losses to offset other gains, the shareholder might select the stock with the lowest cost basis. 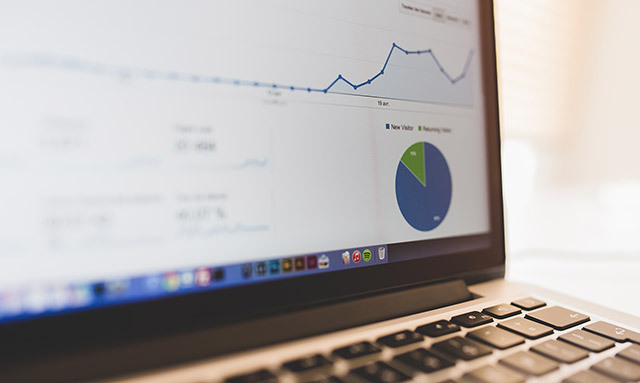 Mutual funds use the same methods to reduce, or smooth out, the reported capital gains distributions for their shareholders as they rebalance their portfolios. For example, suppose someone bought 100 shares of the XYZ company at $25 a share in 1990, bought another 100 shares of XYZ at $50 a share in 2005, and now wishes to sell 100 shares of XYZ at the current price of $100 a share. Under current law, the shareholder could designate the second block of shares to be sold, for a gain of $5,000. Under the Senate provision, he would have to report the first block as the one sold, for a gain of $7,500. The result is a back-door increase in capital gains tax rates. Older savers would lose some of the advantage for their heirs of step-up in basis at death if they must sell the first shares first. They would feel locked in or might sell other securities to avoid selling any of the holdings in which old gains are present. Being pressured to keep shares one does not want and sell those one would rather keep would discourage rebalancing, make shareholding less attractive, and raise the cost of capital a bit. Taxation of capital gains is a form of double taxation. Being able to select which shares to sell, deferral of gains until realization, and step-up in basis at death reduce the double taxation. Forcing the use of FIFO acts to increase the double taxation and works against all three protections. The back-door capital gains tax hike due to the FIFO provision is not offset by any reduction in the tax rate on capital gains or dividends in the individual side of the reform. The bill reduces the corporate tax rate, which does reduce the double taxation of corporate income from the corporate side. The FIFO provision takes back a small portion of the improvement. The goal should be to erase the double taxation altogether. FIFO runs counter to the cost-of-capital reduction from the corporate rate cut. The Joint Committee on Taxation estimates that the provision would raise a total of $2.7 billion over ten years. The very low revenue score may reflect JCT estimates that raising taxes on capital gains from current levels has historically discouraged the taking of gains, producing little or no revenue for the Treasury. [i] Although the provision is estimated to raise only a small amount of money, it will affect the management of several trillion of dollars of individual and mutual fund assets. The inconvenience-to-revenue ratio seems very high. The Senate tax reform bill is a major growth generator, but some of the provisions go in the other direction. This FIFO requirement is one. [i] The Tax Reform Act of 1986 raised capital gains tax rates substantially. Realizations collapsed, and revenue fell well below pre-1986 levels for a decade as a share to GDP until the rates were brought back to pre-1986 levels in 1997. Much is being made of the recently released revenue statistics from the Organisation for Economic Co-operation and Development (OECD) indicating that the United States has one of the lowest overall tax burdens at 26 percent of GDP, ranking the U.S. 31 st among the OECD’s 35 member nations. Only Turkey, Ireland, Chile, and Mexico had lower overall tax burdens than the U.S. in 2016. Some news reports suggest that our ranking as a “low-tax” nation could undermine one of the key rationales for Congress’s efforts to overhaul the U.S. tax code. However, it would be misleading to interpret this ranking as an indication that the U.S. tax system does not need fixing. First, most of the difference between our tax burden and that of other nations is explained by the fact that the U.S. does not levy a value-added tax (VAT). If we subtract taxes on goods and services from the national totals, the U.S. tax burden would rank about average in the OECD. What the headline figures gloss over is that the U.S. overrelies on taxes on personal and business income, which OECD economists have determined are the most harmful taxes for economic growth. Furthermore, the U.S. income tax system is very progressive and the tax base is very narrow. We rely on a relatively small group of taxpayers to pay most of the taxes collected from both the individual and corporate tax systems. In a landmark 2008 study, Tax and Economic Growth, economists at the OECD determined that corporate income taxes were the most harmful taxes for economic growth, followed by taxes on personal income. Taxes on consumption and property were determined to be less harmful because they are levied on less mobile factors in the economy than capital or labor. Yet the U.S. relies more heavily on these economically harmful taxes than nearly any other developed nation. According to the OECD’s new publication, 49.1 percent of all tax revenue collected in the U.S. by all levels of government are generated by taxes on personal income and business profits. As the nearby chart shows, the simple average among OECD nations is 34.1 percent of total tax collections. 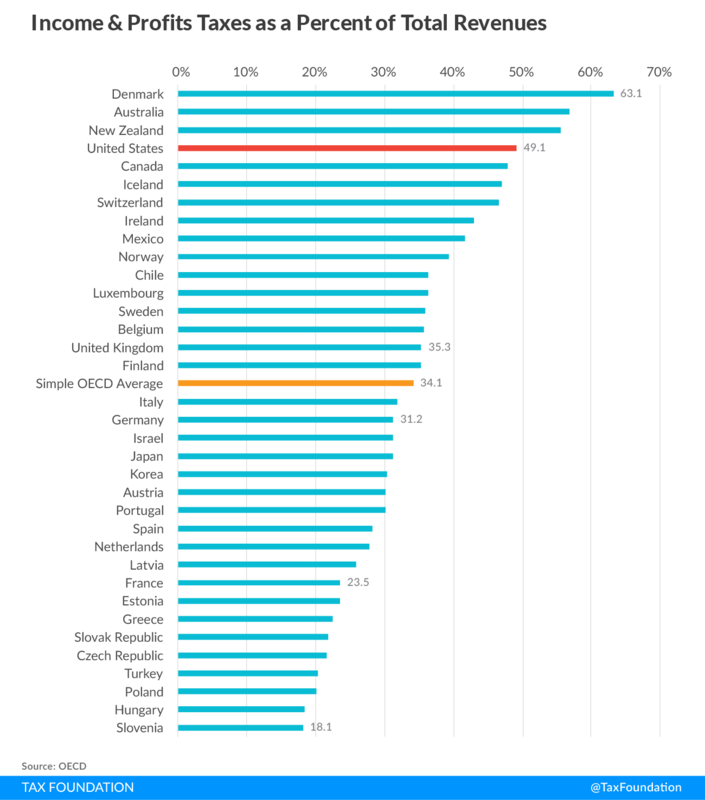 Only Denmark, Australia, and New Zealand rely more on personal income and business profits taxes than does the U.S. In their 2008 study, OECD economists also found “evidence of a negative relationship between the progressivity of personal income taxes and growth.” Yet the U.S. income tax system is very progressive. 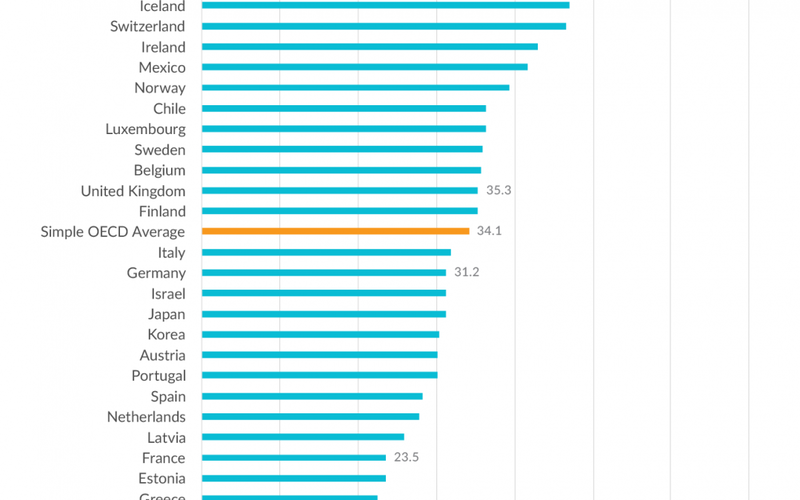 True, our top marginal tax rates may not be as high as the rates imposed on high-income taxpayers in other countries, but the share of the tax burden borne by high-income taxpayers in the U.S. is the highest in the OECD. Another OECD study found that the top 10 percent of taxpayers in the U.S. pay a larger share of the income tax burden than do the top 10 percent in any OECD country, while our poor pay the lowest share of income taxes compared to the poor in any other country. Indeed, in 2015, some 51 million taxpayers—or 34 percent of all filers—paid no income taxes because of the credits and deductions available to them. The chart below, based on Congressional Budget Office data, illustrates how progressive the income tax system is today. The top 20 percent of households—which starts at $117,000 for a two-person household—earn more than 50 percent of the nation’s income, but they pay nearly 90 cents of every $1 of federal income taxes collected. The ratio is even more extreme for the top 1 percent of households. The top 1 percent of households—which starts at $500,000 for a two-person household—earn 15 percent of the nation’s income, but pay 38 percent of federal income taxes. That’s a burden twice their share of income. By contrast, the bottom 80 percent of households collectively earn 47 percent of the nation’s income but pay just 12 percent of federal income taxes. Isolating middle-income households, we can see that they earn 14 percent of the nation’s income but pay just 4 percent of income taxes. The bottom 40 percent of households actually receive more tax credits and refunds from the IRS than they owe in income taxes. Thus, their “income tax burden” is actually negative, as is illustrated in the chart. 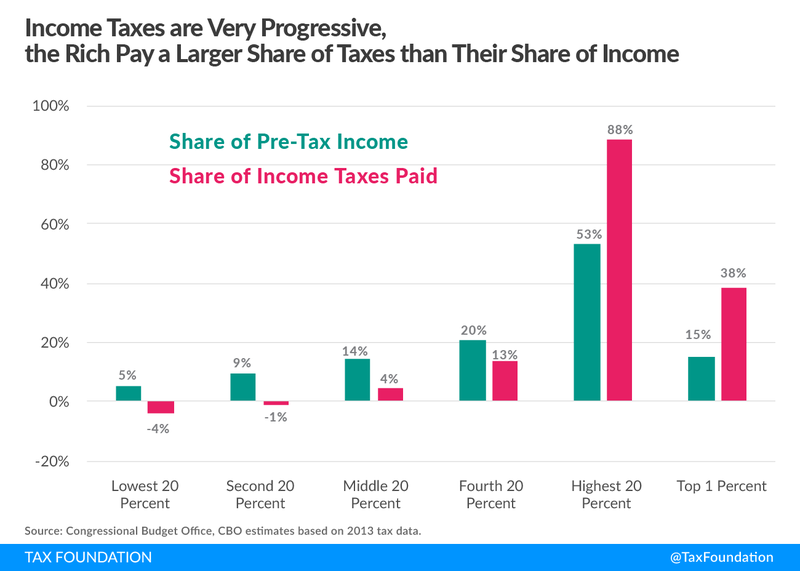 Despite the frequent rhetoric about corporations not paying their fair share of taxes, when it comes to which taxpayers shoulder the greatest tax burden, the corporate income tax is even more progressive than the personal income tax. In 2013, the most recent data available, there were about 1.6 million C corporations. (Interestingly, this was the fewest number of C corporations since 1974). The vast majority of these firms are small or mid-sized; only about 1,600, or 0.01 percent, had more than $2.5 billion in assets and only about 4,000, or 0.25 percent, had assets above $500 million. Yet, as the nearby chart illustrates, 70 percent of the $293 billion in corporate income taxes paid in 2013 was paid by the 1,600 largest firms, those with more than $2.5 billion in assets. 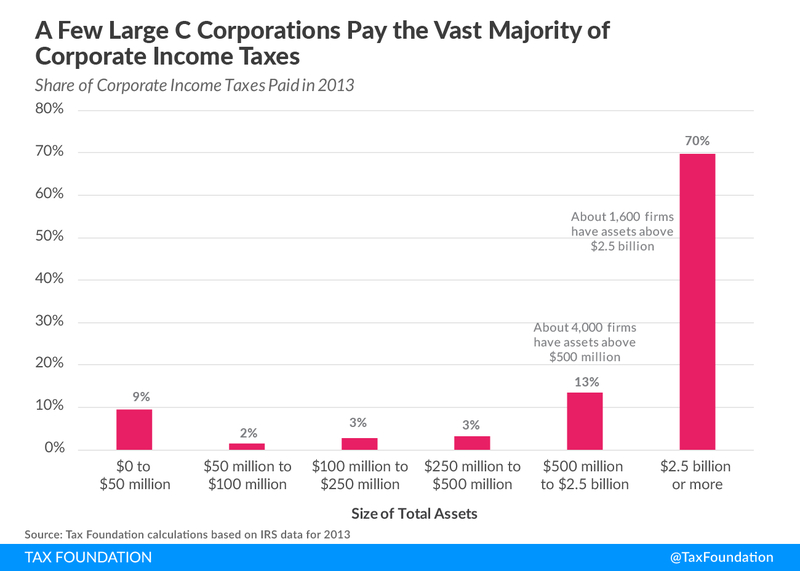 Adding the share paid by firms with more than $500 million in assets means that 83 percent of all corporate income taxes were paid by the top 0.25 percent of corporations. In other words, the remaining 99.75 percent of U.S. corporations paid just 17 percent of all corporate income taxes. How a country raises tax revenues is often much more telling than how much its tax system actually raises. The OECD’s latest revenue statistics showing the U.S. to be a “low-tax” nation is a good example of how a single statistic can be misleading. Pundits who cite the OECD’s headline finding should look deeper in the report. They would find that the U.S. is overly reliant on what OECD economists have determined are the two most harmful taxes for economic growth, corporate and personal income taxes. IRS data further shows that our income tax system is highly progressive and attempts to collect the majority of tax revenues from a shrinking number of taxpayers. This is neither equitable nor economically intelligent.